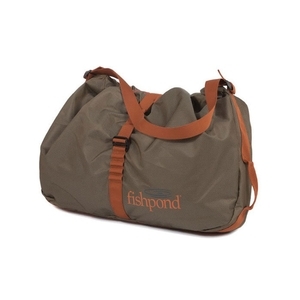 Fishpond Burrito Wader Bag. The Fishpond Burrito Wader Bag keeps your wet river mess inside. Easily store your waders, boots, and wet gear in this bag after a day on the water. This bag also zips open into a changing mat to keep your waders off of hard and possibly jagged surfaces. This bag is constructed with 210D cyclepond fabric and has a DWR finish to keep moisture inside.